Every July I spend time among my trees hand-thinning apple clusters. For twenty plus trees, it is time consuming. There will be spiders. My chickens get underfoot chasing the dropped fruit. But it is worth every moment of my time when harvest arrives. It hurts to break off all that potential fruit, but I do it anyway. (I try to maintain 6-8” between single fruit along each branch when thinning.) This photo proves why. These are apples from the same tree. The large apple is the only one from a cluster I thinned. The smaller ones are from a single cluster I missed behind some leaves. Which would you rather have? 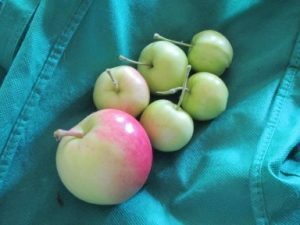 A lot of seedy small apples, or a one large, juicy one?